How to Move Up a Level. What does this have to do with table tennis, besides the fact that I'm a table tennis player at a science fiction and fantasy writing workshop? Actually quite a bit. During the workshop I had the first seven chapters of my SF novel "Campaign 2100" critiqued, and soon I will start the final rewrite on it. The novel has lots of table tennis! I blogged about this on June 13, where I even listed the table tennis scenes and changes in the sport, including "Spinsey pinhole sponge." (One of the main characters is a professional table tennis player who, up match point in the semifinals of the national championships, walks off the court to join - and eventually run - a worldwide third-party challenge for president of Earth in the year 2100. He also coaches the son of the presidential contender, and coaches and then does an exhibition for the Chinese leadership with an alien ambassador.) The table tennis scenes have mostly gone over well with readers and critiquers, even though they are not table tennis people. Since I was out of town for nine days, here's the question that comes up: What does one do to stay in table tennis shape when on vacation or out of town for an extended period for some reason? Assuming you can't arrange TT times at the new location, the answer is to shadow practice. (Here's my article Shadow Practice for Strokes and Footwork.) I brought my weighted racket to the writing workshop. (I bought it at the 2001 World Championships in Osaka, Japan.) At least once a day I shadow practiced forehand loops and smashes, backhands, and side-to-side footwork. The writing workshop pretty much kept us on the go all day the entire time, so I was pretty tired when I returned - and with no break, I went right back to full-time coaching. We have a one-time camp in Virginia this week, 9AM-4PM, Mon-Fri, and so I'm leaving each day around 7:30 AM (because of rush hour) to make the journey. There are 15 kids in the camp, ages 6 to 14. Even though the camp was open to boys and girls, for reasons we still don't understand there are no girls in the camp. Only two are Asian (though two others are I believe part Asian). All 15 are right-handed. I'm head coach, assisted by John and Wen Hsu (the latter is the camp administrator as well). Since I have to leave so early, to do this blog I have to either do it the night before or get up very, very early. I'm running a camp at MDTTC for disabled veterans, on Aug. 26-29. It's part of a USATT program, which has a grant for such camps. They have seven such camps scheduled - here's a listing. Special thanks goes to Jasna Rather for helping put these together! Here's a new volunteer position with USATT - and an important one! Here's the help wanted article. Here's the video (3:14) from PingSkills. Which Ball Should I Buy? Here's the new blog entry from USATT Board Member Kagin Lee. Former USATT President Sheri Pittman Cioroslan is doing an article every day during the last 100 days of Adham Sharara's ITTF presidency, counting downwards from 100. I was posting them all here, but while I was gone they went from #38 to #28. You can find them all on the USATT News page. I'll likely start posting them again tomorrow. Here's the highlights video (1:36), by Jim Butler. Here's a video (2:33) on this table tennis game you can play on your smart phone. Here's the article on this revolutionary video game. Here's the picture - what should the caption be? Why to Systematically Practice Receive. During the Potomac Open this past weekend there was an interesting match that illustrated this. One was a lefty rated over 2400, the other about 2300. The lefty kept serving breaking serves to the righty's wide forehand. The righty would move to his wide forehand and loop these crosscourt to the lefty's backhand. Over and over the lefty would quick-block these to the righty's backhand, and the righty was caught out of position over and over. At first glance it would seem the righty just wasn't fast enough, that the lefty was just too quick. And so the lefty won the first two games. But then a strange thing happened. I was commenting to some players sitting next to me how the righty was looping off his back foot when he looped these serves, and so finishing off balance. This kept him from getting a quick start to cover his backhand. But sometime in the third game, completely on his own, the player figured this out. The key was to get his right foot wider on the receive so he could push off it, and then he could use the momentum of his own forehand follow-through to help move himself back into position. Two things happened because of this. First, by getting his right foot farther out he was able to push into the shot harder, thereby getting more speed and spin on his loop, which gave the lefty problems. Second, and more importantly, he was now following through into position, and was set for those quick blocks to his wide backhand. How often have you attacked with your forehand from the backhand side, only to get caught when your opponent quick-blocked to your wide forehand? (Or the reverse, attacked from the wide forehand, and got caught on the wide backhand, as discussed above?) Most often the problem isn't being too slow; it's finishing the forehand shot off balance, which dramatically slows down how fast you can recover back into position. The most common situation is a player steps around the backhand corner to use the forehand, but is rushed, and so ends up following through too much to his left (for a righty), leaving him wide open for the next shot. Instead, when attacking from a wide corner, whenever possible try to follow-through right back into position, and you'll be surprised at how much easier it is to recover for the next shot, even if it's quick-blocked to the far corner. They were held May 14-17 in Auckland, New Zealand, for players over age 40. Here's the home page for the event, with lots of news items, pictures, video, and results. Here's the ITTF Page with lots of articles. There were 1665 players entered, including 29 from the U.S. (see player listing, which lists them by country). Here are the results. Do a search for if you want to see how players from a specific country did (for example, "USA"). Charlene Xiaoying Liu, who is from my club, finished third in Over 60 women, losing deuce in the fifth to the eventual winner (who would win the final easily 3-0). Charlene was actually up 10-8 match point in the fifth, alas, but struggled her opponent's serve at the end. Here's the article - wow! Here's the article (on their home page). Here are some pictures of the new Triangle Table Tennis Center. Here's the article. They now have 220 members, which equals the International Volleyball Federation. Here's the new video from PingSkills (14:45). Here's the picture! I think I once ran a similar picture, but this one really shows how the "sport" is played! Most players understand this, but don't really absorb how important this simple lesson is. Here are two examples. On Monday I was teaching the backhand loop to a beginning/intermediate class. I don't have a particularly good backhand loop, so I had assistant coach John Hsu demonstrate it. It seemed a good time to also teach the blocking, so I went over that as well as I blocked John's loop. Then I pointed how at the higher levels many players topspin their blocks, essentially mini-loops, and explained how while I blocked the normal way (relatively flat), John almost always topspins his blocks. Another example was two kids I watched play yesterday, both ten years old. One was the #1 10-year-old from Japan, about 2000 level, visiting for a week along with his older brother (about 12 and 2250 level). He was playing a 10-year-old from my club who was about 1900. The Japanese kid had been taught to attack relentlessly, and that's exactly what he did, attacking not only off his serve, but attacking nearly every serve as well, often with over-the-table backhand banana flips. For much of the match the kid from our club was constantly on the defensive as he could only push the Japanese kid's serve back, and his own serves were often slightly high and were getting pulverized. He tried attacking the serve, but unlike the Japanese kid, he hadn't really trained that shot, and so was pretty erratic, and went back to pushing. Then he simplified his own serve to a simple backspin serve so that he could serve lower, and the Japanese kid started missing - and it became apparent that if he couldn't attack the serve as he'd been trained to do, his game went down quite a bit as he didn't push or block well. And so what started out as a rout got close. The Japanese kid won, but it was a battle. And now our kid is going to learn to serve lower with his normal serves, and to backhand banana flip. A few key lessons from all this - train to develop a complete game. Develop both forehand and backhand. Develop effective serves that are low to the net. Develop receives that handle all situations. And develop the ability to both attack and to handle the opponent's attack. Here's the video. I've done this drill numerous times in training camps. Those "ladders" are great for physical training. Here's the picture. Hey, let's go play table tennis out in the bay! Here's the video (1:37) - and don't get me started on analyzing the players' technique…. At the MDTTC tournament this weekend player I was coaching was having trouble against a much higher-rated player who had nice last-second change of directions on his receives. Over and over he'd start to push the ball one way - usually to the backhand - and at the last second, would change and go the other way. (Here's a Tip on this, "Pushing Change of Direction.") Although my player kept the first game close when the other player kept going for (and missing) some difficult counterloops, this last-second change of directions completely stopped my player's serve and attack. He'd see where the ball was going and start to move to attack, and then, suddenly, the ball would be somewhere else, and he'd be lunging to make a return. Between games I told him to focus on three things. First, go completely two-winged to follow up his serve - if the receive was to his backhand, backhand loop, while if the ball was to the forehand, forehand loop. Players who can't do this when necessary have a major weakness in their games. Second, since he wasn't trying to follow with the forehand, I told him to take his time and just wait and see where the ball was going. He was so used to reacting quickly that his own instincts were going against him as he reacted too quickly. This showed that most players are too obvious in their returns, telegraphing their receive way too early. It also showed how effective it is when a player learns the seemingly basic idea of not telegraphing the receive, i.e. changing directions at the last second. The tactics worked as my player won game two. Alas, remember those difficult counterloops the opponent missed in the first game? He stopped missing them, and managed to barely pull out two close games to win the match and avoid a major upset. We had a tournament this past weekend at the Maryland Table Tennis Center. You can see the complete results - including every preliminary match - at Omnipong! One thing you can't see is the shot of the year, by Raghu Nadmichettu, who's about 2400. He was playing against Nam Nguyen in the Open, a 2100+ player. (Both are righties.) Nam ripped a ball to Raghu's wide backhand, which Raghu fished back. Then Nam ripped another to Raghu's extreme wide forehand. Raghu raced over and made a lunging return from his wide, wide forehand, which left him stumbling into the adjacent court. Nam creamed the ball with a powerful sidespin kill-loop that broke wide into Raghu's forehand again. From the adjacent court, Raghu counter-ripped a backhand sidespin counter-kill-loop from his wide forehand (!). The ball came from outside the table, curving to the right as it went toward the table, and hitting right on Nam's backhand corner for a clean winner. Okay, maybe you had to be there, but page down below to the segment on Timo Boll's backhand passing shots and watch those examples. Now imagine them right-handed, at twice the speed, and done with a backhand from the wide forehand side from the adjacent court, with the ball smacking into the far right-corner. In my blog on Feb. 28, I wrote, "Right now there's really only one USA player who is basically a full-time professional player, Timothy Wang. I've been told that Chance Friend of Texas also makes a living as a full-time professional player, playing in the German Leagues. (I've amended the blog.) So perhaps it can be said that Timothy Wang is the only professional player in the U.S., since Chance is making a living at it overseas. Here's his blog from last week where he talks about different types of ping-pong balls (celluloid vs. the new plastic ones, different sizes, and seamed vs. non-seamed). He covers the topics well, including how the various spinning balls move through the air and jump off the paddle. One picky little thing not covered - how the ball would bounce off the table differently. One of the key hidden reasons looping is so effective is how it jumps when it hits the table, unlike a regular drive which goes at a more constant speed, making it easier to time against. It's also why off-the-bounce looping is so deadly, because you are already rushed to react to the shot and then it suddenly jumps even more quickly. On Feb. 21, I blogged about USATT Board Chair Mike Babuin's blog. Here's a discussion on about.com about it, where one player posts a lengthy criticism, and Mike responds, also in lengthy fashion. Here's video (64 sec) of the German star snapping off backhand counterloop winners. Here's a video (35 sec) that features three great drop shots against topspin in one rally. Why don't players do this more often? Here's video (2:44) of a 193-shot rally (mostly pushing) between two top choppers. One of them finally and bravely finally ends the point! You don't see too many points like this anymore. Here's an article featuring table tennis in general and in Boca Raton, Florida. Now another team is playing table tennis! Includes a picture of Wil Myers playing David DeJesus. Here are photos of the Phoenix Suns basketball star hitting with Coach Matt Winkler. On the March 1 episode of Mythbusters asked themselves if supersonic ping pong can go lethally wrong. And so they created a supersonic ping-pong ball canon. I've linked to other such ping-pong ball canons, but Mythbusters took it to another level, with the ball reaching speeds in excess of 1100 mph! 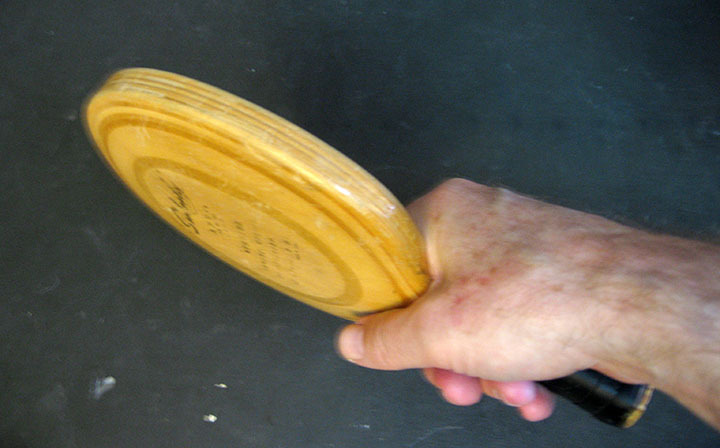 The ball went cleanly through a ping-pong paddle, leaving a ball-sized hold. However, after testing it against a giant pork shoulder, they concluded it did not do lethal damage. Here it is, where he discusses ping-pong. "The thing with ping pong is, it’s a sport pretty much everyone has played. And everyone thinks they’re great at it. And I just like to show people the truth." Now I wasn't using my best fast-breaking sidespin serves or the sometimes almost unreturnable dead ones, but few players have those serves except at the higher levels. But I'm going to press Doug on this, and soon he'll be facing these nightmares - and if history repeats, he'll get used to them. I do a similar thing with other students. Sameer had trouble with a player's deep sidespin serve to his backhand in a tournament, so we played games where all I did was serve that serve. When he got used to it, I started throwing two variations at him and later more. Now he's comfortable with the serve when he sees it coming, and reacts to it pretty well even when I vary the serve. One of our top juniors had fits with certain short serves to his forehand. So we played matches where I gave him that serve over and Over and OVER. Soon he was flipping it all over the table and I had to practically retire that serve against him in matches. Yes, my goal is to teach all my students to return all my serves so that soon they'll all be beating me. It always amazes me that players win or lose more on serve and receive than anything else, and yet few actually practice these things systematically. I won't miss Halloween completely. Besides bringing some of the candy to give out to the class (for those who like sugar! ), I've got a Scream mask that I might put on during the class near the end. Or maybe I'll feed multiball in it. I've always had this dream of showing up at a club anonymously in some sort of costume (such as a gorilla suit, though a scream mask will do), and silently play matches all night and beat everyone. Scary ping-pong ball eyes on creepy people! Note the illusion that the head is constantly getting bigger? Kid dressed up as a ping-pong table. Kid dressed up as a ping-pong paddle. But what's the kid on the left, and what's a "Ping Pong Domo"? Guy dressed up as a beer pong ball. Note his buddy dressed up as the beer pong cup. Three guys dressed up as a ping-pong ball, table, and beer pong cup. 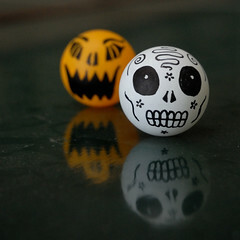 Skull table tennis. "Live the good life. Play Table Tennis." 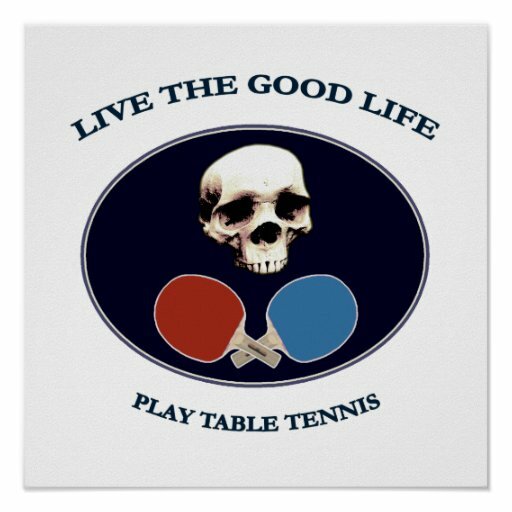 Skull table tennis on a shirt. "Losing is not an option." Happy Halloween ping-pong ball wreath. 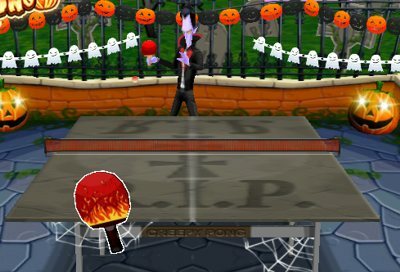 See how many ghouls you can kill in Creepy Halloween Pong! Another multi-millionaire Baltimore Oriole baseball player has arranged table tennis lessons with me. Ho hum. I've already given lessons to JJ Hardy and Brady Anderson, and hit with a bunch of their players at their clubhouse. For now, the new one wants to stay anonymous. However, after taking a few lessons, he plans to play in our leagues during the off season. Yesterday I posted a link to USATT Board Chair Mike Babuin's blog with his thoughts on the new polyethylene balls, which are supposed to replace the current celluloid ones in ITTF events on July 1, 2014. (USATT would presumably match them, as they usually do on rule changes.) Here's USATT Board Member Kagin Lee's blog about this last week. However, if you want to test these balls for yourself, JimT posted in the comments in my blog yesterday that you can order them from eacheng.net, which I just did. Cost for three balls was $7.99 plus $5 shipping, so $12.99 total. 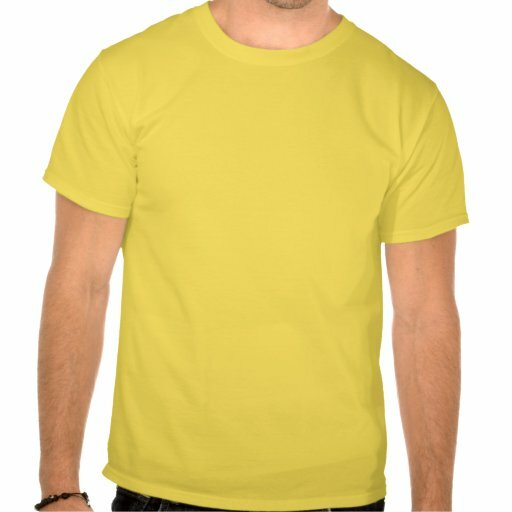 (Choose "BY AIR-small packet" for the $5 shipping, unless you are in a rush.) Once I have them I'll try them out, and let others from my club as well, and report back here. Just a quick update - the knee seems fine now, though I'm still leery of making sudden moves, especially to my wide forehand. I'm wearing an Ace knee brace, and will probably keep using it for a while. Here's the story from Table Tennis World! So which of these three serves is the funniest? There is an unofficial policy at ITTF Pro Tour events that when two players from the same country play, there is no coach for either player. This makes sense in Europe and Asia, where the top players train together, often under the same coaches. But in the U.S., where players mostly train on their own with private coaches in private clubs, it doesn't really make sense. I was hired to coach MDTTC players at the U.S. Open, but didn't do so in many of the ITTF pro tour matches because of this. The following isn't really a complaint, but more of an observation of the problems that arose because of this that I hope can be resolved in the future. Complications arose because it wasn't a rule, just a guideline. All ITTF Pro Tour participants received an email from USATT requesting that they not have coaches when playing other USA players. However, since it wasn't a rule, we would never know in advance if the other player would follow the guideline. And so I had to be available to coach these matches, just in case. The problem was that to do that, it meant someone else had to coach other players from MDTTC, and often that meant I wouldn't be coaching a player I normally would coach because someone else was assigned that match since we didn't know if I'd be available. Later an MDTTC player played a player from China I'd never seen before, a non-USA citizen, from a club 3000 miles from us, and again I was asked not to coach. The player did live in the U.S. and had entered through USATT (as all USA players were required to), but somehow there seemed something strange about my not being able to coach this match. But I decided not to create an "international incident" and so didn't coach. Then things go tricky in another match. The ITTF Pro Tour referee, Bill Walk, sat down near me. He noticed I wasn't coaching an MDTTC player who was playing a U.S. player from another club, and asked why. I explained. He got very angry, said it was not a rule, and encouraged me to coach the match. He said he had explained this to the umpires in the official's meeting, and didn't believe coaches should be asked not to coach their players against USA players. I was tempted to coach the match, but not wanting to cause problems, decided not to. Obviously we're not all on the same page on this guideline that isn't a rule. I hope that the powers that be can get together and either make this a rule or drop it as a guideline completely. I don't see how it's different coaching a Maryland player against a California player in a junior singles event as opposed to an ITTF event. However, I also know it's easy to make an argument for or against this guideline - but if we're going to do it, please make it a rule, and not a guideline that we never know will be enforced. And if we are going to not allow coaching against USA players in these big matches because we're all on the same "team," then we need to actually train together as a team and play as a team, rather than just pretend we are when we really are not at this time. This reminded me of problems in the past in international events. In Europe and Asia, most top juniors train under the national coaches for at least several months a year, often year round. When they play at international events, the national coaches know the players. In the U.S., this doesn't happen; at most, the USA national coaches have a few days per year working with the National Junior and Cadet Teams. And yet, when USA plays international matches, our top juniors and cadets are normally coached by the national coaches, who don't always know their games, rather than their private coaches, who do, even when the private coaches are available. Our top juniors and cadets reached the levels they did with the work of their own coaches, and it doesn't make sense to then send them on the international stage and handicap them by using coaches who don't really know their games. This isn't a rap on the national coaches, but on the situation where our top juniors and cadets don't train together with the national coaches. I'm all for the national coaches coaching our top juniors and cadets in international events once USATT is able to have them work together for at least a month per year. Until that happens, why handicap our top juniors and cadets when they reach the international stage? We just started week four of our ten Mon-Fri camps this summer. I missed week three because of the U.S. Open. Yesterday's focus was the forehand; today it'll be the backhand. I'm missing four of the weeks because of travel (see below). Here's USATT Board Member Kagin Lee's blog on the U.S. Open. Here's an essay on the topic from Table Tennis Master. Here's a video (5:56) of the best penholder plays. I saw it last night. The movie features a very short TT scene. Here's the description from IMDB: "There's a brief shot in the film in which Edith is playing ping pong with a minion, but uses a pair of nunchaku as opposed to a ping pong paddle. This is a reference to a famous Chinese Nokia commercial in which a Bruce Lee impersonator in a mock "lost home video" also plays a game of ping pong using only a pair of nunchaku." There's also a party scene where the minions are sitting about on the ping-pong table. Here's an online video (11 sec) of the minions playing table tennis (tennis-style) that's not in the movie.